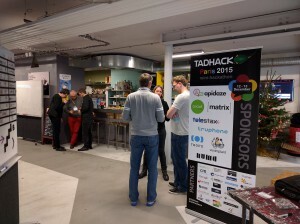 This is part 2 of the TADHack Paris review. Part 1 is here. TADHack Paris ran over the weekend of the 12th and 13th December at NUMA Sentier, just before the WebRTC Conference and Expo. The Hackathon focused on WebRTC and the sponsors’ resources: Apidaze, Circuit by Unify, Telestax, Tropo (CiscoSpark), Truphone, and VoxImplant. The sponsors provide an introduction to themselves and their resources in this TADHack Paris webinar. We had about 60 people on-site, with several remote entries. By 10 minutes past the official start time about 40 people had arrived, by lunchtime we brought in extra chairs. Jean-Luc Nguyen in just 24 hours did an amazing job with CrowdSalers using Circuit to create a module that can be plugged on any marketplace product page to allow customers to interact with other customers and product specialists via text, voice and video chat. Its used many of the Circuit API capabilities including presence, and all created in 24 hours. Bart Uelen was back at TADHack with an interest hack ”Caminos del Mundo” – triggering a Videochat from within Meteorjs. He showed a journey and traveling app for organizing in real time your journey’s impressions like photos, text and videos and have people who stayed at home engage in your journey by joining a videochat using Apidaze. It was a cute hack, and given Bart loves to travel, a very appropriate one. Habib Ben Yahia used Apidaze, NodeJS, socket.io and PHP to create his hack TADHack-plopplip to manage appointments with WebRTC, IVR, Voicemail and SMS. Using the actions we do everyday to create and remind us of meetings and appointments. Noud Esselink showcased an interesting WebRTC service, Smart Nephews, a real time communication app for webshops. Sam Machin squeezed in a hack called “Alexa on the Phone” using Truphone. Its built on a hack he’d created were he linked Alexa on his Amazon Echo to the web and now to the phone for control of his home lights. Needless to say, some in the audience started calling the number and controlling his lights at home. Abraham and Jean Michel were new to hackathons and telecom APIs. They created a hack called Simple Deal using Apidaze. It was an app for selling things with WebRTC. Though not fully working, and presenting in a foreign language they did well, and I hope to see them in future hacks. And to wrap up all the pitches we had Vladimir Beloborodov showcase his hack Thermal RTC. He linked a thermal camera to his phone using WebRTC, and showed a neat thermal image of the room. It was a fun wrap-up to an intense pitch session.